BaySpec’s RamSpec™-HR dispersive 1064 nm benchtop Raman spectrometers are turn-key solutions designed for best-in-class performance and resolution for dispersive 1064 nm Raman spectroscopy, offering maximum fluorescence background suppression. The system is equipped with three dedicated, highly efficient VPG® gratings and an innovative, deep-cooled InGaAs detector to produce high-resolution (4 cm-1 ) and high-quality dispersive 1064 Raman spectra with full spectral coverage (100-3200 cm-1 ). The rugged benchtop platform of the RamSpec™-HR is an ideal system to replace bulky, slow, expensive and hard-to-operate FT-Raman systems. Both direct sampling option and Raman fiber probe attachment option are available. 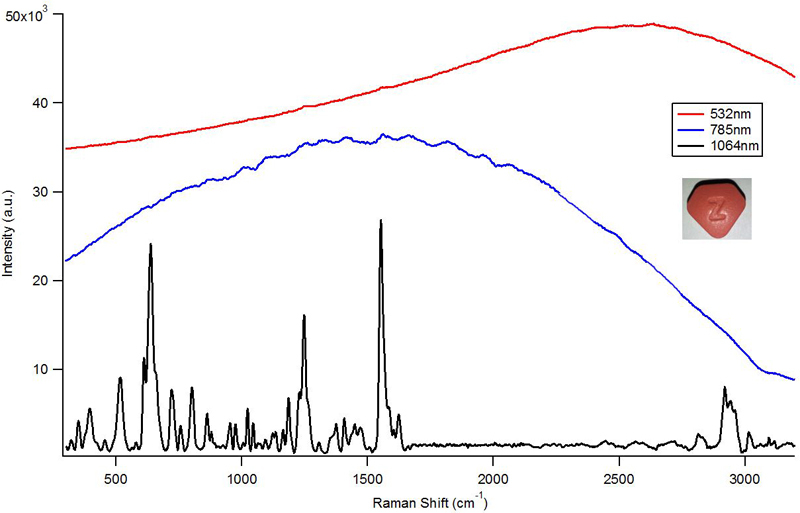 Raman spectra of the Zantac® tablet collected through the coating by 532nm, 785nm and 1064nm Raman Spectrometers.